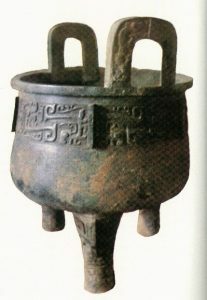 The Zhou conquered the Shang Dynasty about 1100 BC (the traditional date is 1122 BC). The Zhou said that the reason they were able to conquer the Shang was that Heaven was on their side. According to Chinese stories, backed up in some points by oracle bones, the first really independent king of the Zhou Dynasty was King Wu. What was the Shang Dynasty like? According to the stories, King Wu led a big army with chariots down the south bank of the Yellow River. In 1046 BC King Wu crossed the Yellow River and conquered the Shang Dynasty at the Battle of Muye. Many of the Shang soldiers went over to King Wu’s side, because the Shang emperor, Di Xin, was unpopular. Historians call the first period of Zhou rule the Western Zhou, because the capital city, Haojing, was in the west. China was divided up into about 200 little kingdoms, and then each of these kings was under the Zhou emperor. Under each king were lesser lords, who had less power. These lords gave out land to individual farmers. In exchange, the lords collected some of the food as taxes. This system is a kind of feudalism. How did taxes get started? Why do people use feudalism? During the Western Zhou dynasty, the emperors ruled from great walled cities like those of the Shang Dynasty. Western Zhou emperors relied on big strong armies to stay in power. These armies learned from Central Asia how to use a lot of chariots all together to win battles. Did you find out what you needed to know about the Zhou Dynasty in China? Don’t miss our articles on the Eastern Zhou, Zhou art, and Zhou architecture! Cite this page: Carr, K.E. Zhou Dynasty China – Ancient Chinese History. Quatr.us Study Guides, June 6, 2017. Web. April 22, 2019. Sure, Ezekiel! How can I help?